Paolini began writing The Inheritance Cycle at fifteen, this book being the fifth in the series set in the world of Alagaesia. The hero, Eragon departed from the there a year ago in search of the perfect home to train a new generation of Dragon Riders. He must undertake a seemingly endless sea of tasks: constructing a vast dragonhold, wrangling with suppliers, guarding dragon eggs and dealing with belligerent Urgals and haughty elves. A vision from the Eldunari, unexpected visitors and an exciting Urgal legend offer a much-needed distraction and a new perspective. 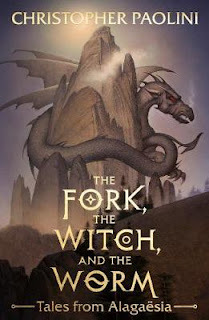 Paolini’s Inheritance Cycle series (Eragon, Eldest, Brisngr and Inheritance) has sold more than 35 million copies worldwide and has been translated into over 40 languages. No doubt this latest book will be eagerly awaited by his fans. If you haven’t read any of the books in the series, you will most likely find his latest difficult as the first chapter mentions numerous characters from the previous books.